When you book your train tickets with Mountain Top Cabin Rentals, you can receive up to 10% off of your ticket price - Give us a call and ask us how! Reservations must be made by us, at least 24 hours in advance. Some Restrictions or Exclusions may apply. The train regular runs to the quaint, historical twin cities, of Copperhill, TN, and McCaysville, Ga. You can spend time browsing in the shops, having lunch or dinner, or taking pictures being in two places at once on the Tennessee/Georgia state line! They also offer special trips throughout the year. Check back throughout the year for more information on special trips. Please contact our office at 706-258-6220 to reserve discounted tickets. Please know the date, time, number of adults/children/seniors and if you would prefer open air or an enclosed coach train car. 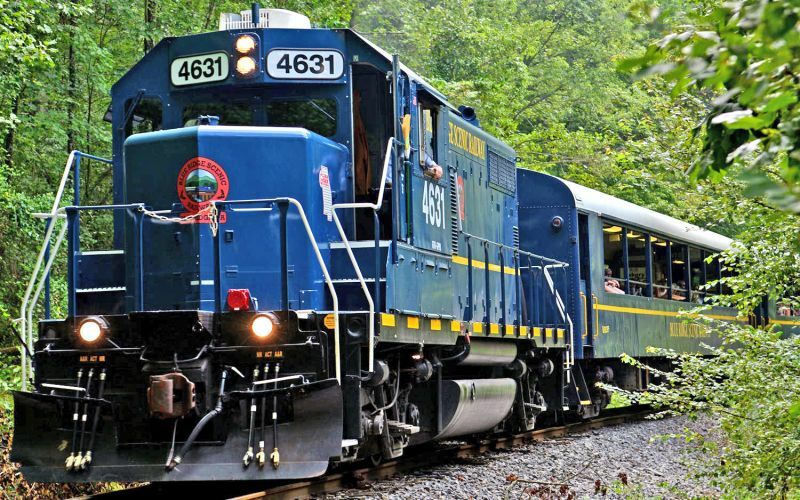 You can also contact Blue Ridge Scenic Railway directly at 877-413-8724 for questions regarding the details on the train itself or specific excursions.